When you write about science, you inevitably learn things. The other day I wrote a brief news story for Australian Geographic, outlining the surprising results of a new study on jellyfish movement. It may very well be the first step towards ‘jellyfish forecasts’. In the process I learned some new facts about jellyfish and my curiosity led to learning many more. Here are a few you might be interested in. No brain, no head, no central nervous system, no skeleton, no respiratory system. 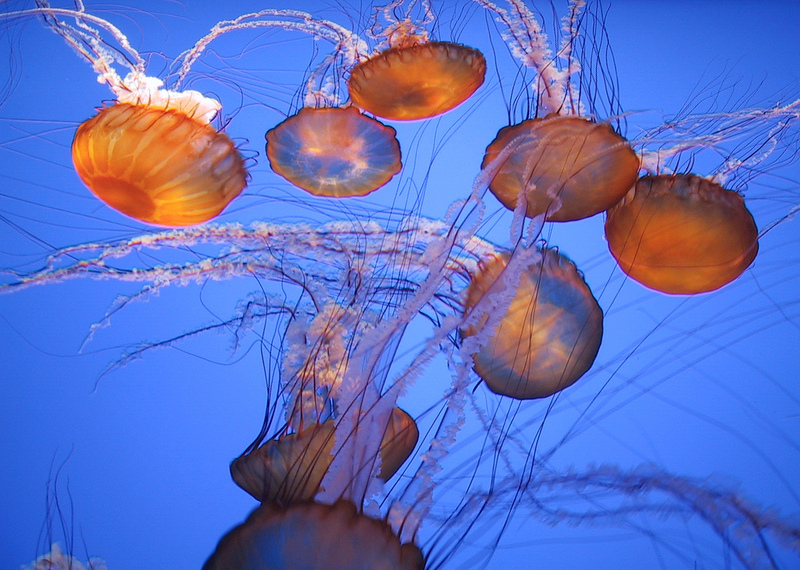 The body of a jellyfish consists of a pulsating bell which propels the animal as it swims through the ocean, with a trail of tentacles or arms behind it. They are symmetrical around a central axis and have no left and right side, as is typical with most other animals. They do have nerves, though – the fibres are largely distributed in a net across the outer layer of the organism. A jellyfish consists of three layers of cells – the epidermis on the outside, the gastrodermis on the inside, and the mesoglea sandwiched in between. Mesoglea is the stuff that gives jellyfish their name; it’s a translucent, thick substance largely made out of water that maintains the animal’s shape in the same way a skeleton would do. Throughout the mesoglea run nerve fibres and muscle bundles. Jellyfish are not vegetarians. Their tentacles are covered in nematocysts – tiny stinging organs that each contain a venom sac, a barbed coil, and chemo-sensitive trigger hairs which detect whether anything has brushed past and needs to be killed and captured. In Australia there is a species of box jellyfish, Chironex fleckeri, that carries the reputation of being the most dangerous creature you can encounter here. Its three-metre long tentacles are basically impossible to spot in the water, but the venom spewed from a sting can kill a person in a few minutes.